Aoki (left), Smith (right). In case you didn't know. 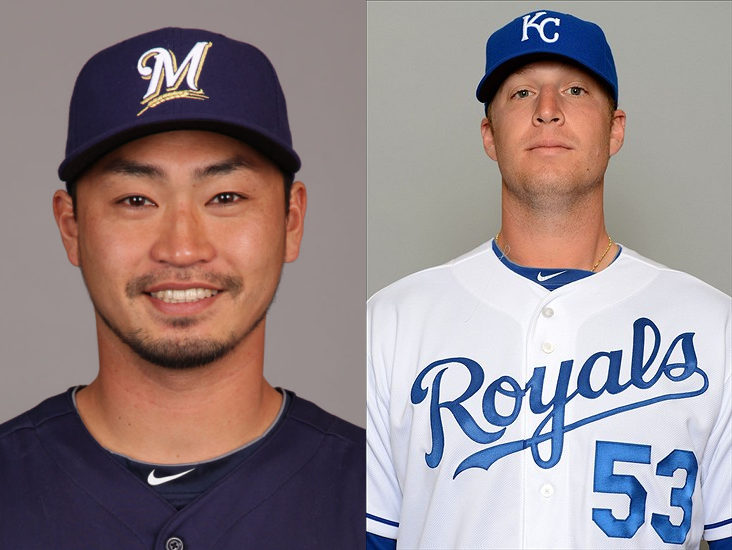 This morning the Milwaukee Brewers agreed to trade outfielder Norichika Aoki to the Kansas City Royals for left handed pitcher Will Smith. With this trade, the Brewers officially announced that Ryan Braun will be making the move from left to right field this spring. I'll get into Will Smith in a bit, but first let's look at what the departure of Nori Aoki does to our outfield depth. And, by depth, I mean log jam. The Brewers had three solid starting outfielders to start the 2013 season in Ryan Braun, Carlos Gomez, and Norichika Aoki. Sitting behind them were Khris Davis, Logan Schafer, and Caleb Gindl. Those three are very sound outfielders that could honestly be starters on other baseball teams. Heck, even in the minors the Brewers have Kentrail Davis who we will likely lose in the Rule 5 draft. 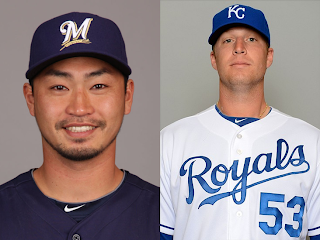 Moving Aoki allows the Brewers to free up space for the younger class to get Big League playing time. Becoming a free agent after the 2014 season, this trade should come at now surprise. People will claim we should have gotten more for Nori, but I'll agree to disagree with that. All signs pointed to a downgrade in productivity this season by Aoki. For one, he lost a full point of oWAR between the 2012 and 2013 seasons. In 2012, Aoki attempted 38 stolen bases and converted 30 of them. In 2013, he attempted 32 stolen bases but only converted 20 of them. He was also picked off a total of 7 times in 2013. That's a huge difference and a sign of declining speed. Defensively, the Royals are getting a premium player. Through two seasons with the Brewers, Aoki carries a .989 Fielding %. In 2013, Aoki had 13 defensive runs saved above average (Rdrs) which is pretty decent for a right fielder. In comparison, Jason Heyward of the Braves had 15 Rdrs, who is considered one of the top defensive right fielders in the game. So, who is the lead-off hitter now you ask? You have a couple different options. In some cases you could have Carlos Gomez lead off too. But, it won't be hard to figure out or lineup. RRR will likely play around with his lineups in spring to figure that out. I'm looking forward to see how the club sorts out their bench for Opening Day. The team basically has three spots locked up already in Martin Maldonado, Scooter Gennett, and whoever platoons with Juan Francisco. 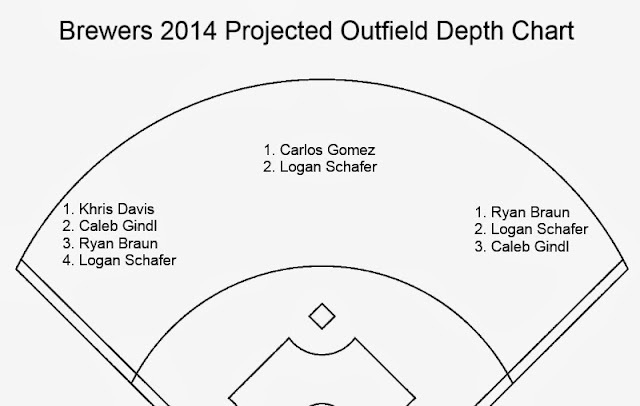 You need to add a back up short stop and then decide between Logan Schafer or Caleb Gindl as your 4th outfielder. In my opinion, you go with speed and defense and stick Logan in there. Now, onto the pitcher the Brewers acquired. Will Smith is a 24 year old left handed pitcher who will likely end up in the bullpen for the 2014 season. He has potential to work his way into the rotation, but he has some work to do to get there. He is arbitration eligible in 2016 and a free agent in 2020. Will had an impressive turnaround in 2013 as a reliever from a somewhat disastrous 2012 as a starter. Will increased his K/9 from 5.9 to 11.6 while reducing his BB/9 from 3.3 to 1.9. Will has an insanely good slider. Researched by the great Alec Dopp, Will Smith's slider held batters to .093/.130/.186 line in 2013 and generated 55.6% chase rate, which was the 2nd highest among pitchers with 33 IP or more. Overlooking the trade, I'd give it a B-. You trade a valuable outfielder who is blatantly getting older and slower. He became expendable with the emergence of Khris Davis and is a free agent after the 2014 season. In return you get a young left handed arm, which is something the Brewers' organization was missing. I'd give it a higher grade because I do believe we could have squeezed out an additional player for Nori. The Brewers have enough dead weight on the 40 man roster where we would be okay to outright someone. I will miss Nori Aoki. The production he gave the Brewers of both sides of the game were greatly appreciated and recognized. The organization loses a humble, passionate player that brought a lot of excitement to The Keg. From his walk up music to his unforgettable inside the park home run, Nori, you were a fun player to watch. Best of luck to you in Kansas City. Enjoy their barbeque. Follow us on Twitter (@WISportsBlog) for up to date news on the Brewers, Packers, Badgers, Bucks, and Golden Eagles. We feature live, in-game commentary, breaking news, previews and post game discussions. Follow the entire Wisconsin Sports Blog writing team on Twitter: @AndrewVrchota, @jheldred, @JoeP_Norton, @olewr7, @Stevie2Westside, and @10iskristin.